Private solar energy offers a ton of benefits, including saving money on electricity and being protected from fluctuating utility electric rates. In addition to helping the user, solar supports a rapidly growing industry; in2017 Solar Photovoltaic Installer was the fastest growing occupation the United States leading to an industry with over 250,000 jobs, with women making up 27% and Veterans 9% of the workforce. With historically unstable global energy markets, price fluctuations can have serious impacts on our economy and your electricity bill. As we take control of our energy supply with solar energy, we insulate ourselves from those price fluctuations. A recent article in Clean Technica entitled “US Military Bases Using Solar, Wind, & Battery Storage for Energy Security” details how the military is partnering with clean energy developers to make bases and their surrounding communities more resilient. Energy independence, reducing U.S. dependence on foreign energy imports, can increase the country’s security in both economic and political arenas. Furthermore, reducing dependence on fossil fuels in general can protect customers from similar insecurities. In many states, demand for electricity spikes in the summer as people cool their homes and businesses, resulting in higher costs that are almost impossible to budget. 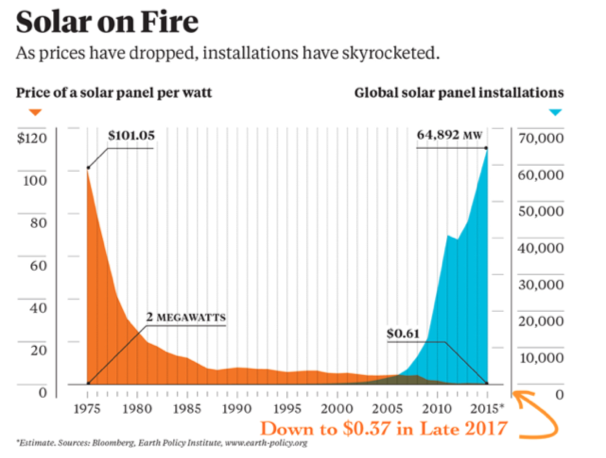 Solar can break customers free of these fluctuating prices, offer stability and reduce energy costs. Despite the fact that the cost of producing solar energy has dropped by 86% in less than a decade, a number of barriers still prevent the majority of electric customers from participating. To use private rooftop solar, a person needs to own a home with enough unshaded space for a system AND have the capital needed to invest. The online solar marketplace EnergySage estimates that the average 6kW system costs over $13,000 after incentives. The Solar Energy Industries Association (SEIA) clearly outlines this issue, writing “Today, many American households and businesses do not have access to solar because they rent, live in multi-tenant buildings, have roofs that are unable to host a solar system, or experience some other mitigating factor.” Shading trees, an old roof, or plans to move are all reasons why some people choose not to participate in solar energy. Sometimes, the hassle of installing and maintaining a system may stop new customers - they simply don’t want a contractor at their home for assessments, installation, and upkeep. The National Renewable Energy Laboratory (NREL) reports that this demographic could equate to over 86% of our population, or 6 out of 7 people. These physical and economic barriers are especially pronounced in low to moderate income (LMI) communities, resulting in a common perception that solar is an exclusive technology reserved for the wealthy few. Regardless of which barrier is present for the customer one thing is clear: if customers can’t access renewable energy, they can’t access the benefits it offers. That’s where community solar comes in. The term “community solar” refers to local solar facilities shared by multiple subscribers that receive benefits on their electricity bills that reflect the system’s production. These systems are physically similar to any other solar array, but their structure allows anyone with an electric bill to participate. Clean energy flows into the grid and subscribers get credits on their electric bills. Community solar provides additional benefits to those offered by private rooftop systems. They are easier to signup for, can reach economies of scale, and support local communities with increased investment. Community solar arrays are placed in locations with optimal solar exposure, maximizing the system’s production. Often, even customers with the ability to purchase a private solar system will choose community solar due to the simplicity of participation. Rather than organizing a site assessment and hosting an installation crew they simply sign up for a share of the system’s production, a process that can take as little as five minutes. With this model of ownership millions of people are able to access solar for the first time. For example, Common Energy recently partnered with the New York State Energy Research and Development Authority (NYSERDA) to provide 7,000 low to moderate income households with community solar energy. Under NYSERDA’s “Solar For All” program, these households will receive clean electricity at no cost for a 10 year period. The energy comes from portions of local community solar farms, the rest of the farm’s capacity is sold to the general public at costs lower than utility rates. It's clear that while solar energy offers huge opportunities, it also has barriers to overcome before every person can participate. Thankfully the fastest growing subsection of the solar energy, community solar, is expanding access to million of people.